Boca House Condo is home to a total of 75 units built over the course of the years 1965 through 1979. The finished development is composed of two buildings, one with 4 stories and 25 units and the other with 5 stories and 50 units. These 1 to 3 bedroom condos range from about 900 square feet to 2,400 square feet for penthouse units. Boca House is ideal for boat enthusiasts as dockage is available for both common and private docks. These waterfront condos are located on the Intracoastal Waterway on Spanish River Road, providing convenient, direct ocean access without a fixed bridge. Other amenities at Boca House include a heated community pool, fitness center, and a scenic BBQ area. 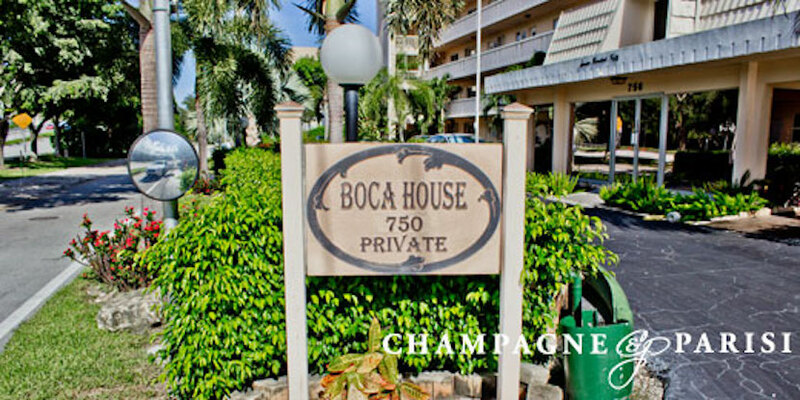 Contact the Boca Luxury Condo Team to purchase your Boca House Condo today! Included below are condos for sale in Boca House Condo, an affordable waterfront condo development in Boca Raton, FL. These real estate listings are updated every 15 minutes from the MLS, providing the most accurate and current detailed property information, as well as large photos, maps, and local school info. Do you want more information about any of the condos in Boca House Condo? Just click the "Request More Info" or "Schedule a Showing" button when viewing the details of that listing. As Boca Raton real estate experts, we not only have access to the property disclosures and past sales history of each property but also the local knowledge and expertise to assist you in understanding and utilizing the information when selling or purchasing a Boca Raton luxury condominium. We can also provide you with the dates and prices of nearby condos that have recently sold in Boca Raton or any of the local developments. Also, please consider registering for a free account which will enable you to receive automatic email notifications when new condos in Boca House Condo come on the market in Boca Raton, FL.